If you think a separation is on the cards, considering your finances should be one of the top priorities. The timing of your separation really does matter where money is concerned. Here are some important factors to consider well before you walk away. When you are married you can make tax free transfers between each other without attracting Capital Gains Tax. Once you separated, you have until the end of that tax year to make tax free transfers. This is particularly important where assets such as property are concerned. “Even if you continue to live under the same roof, you may be ‘on the clock’ if you have taken formal legal steps towards a separation. I always advise my clients to exercise caution and consider delaying a separation until after 4 April if that is feasible” says Karen Fox. If you’ve got a buy to let, don’t assume you can move into it on separation. Check the mortgage terms. Many mortgage companies won’t agree to this. ‘Many clients make the mistake of thinking that they own the property and can just move in, but it may be a serious breach of the mortgage terms that usually prohibit landlords from occupying their own property’ says Christina Hale of FM Family Law. You will need to produce a budget as part of the disclosure process and it’s important to show your usual spending, especially if maintenance is under consideration. Although it may feel counterintuitive to maintain your outgoings when finances are most likely to be under pressure, it’s necessary to help assess the correct level of spousal maintenance. Don’t significantly decrease your spending or your quality of life to save money in the short term. You’re going to be making some important decisions about your money. We recommend advice from experts in their field such as Fiona Sharp and Stephanie Clark at www.vervefinancialplanning.co.uk “if you need help with your post separation budgeting or clear direction through a pensions maze then I can guide you” says Fiona Sharp. You are each jointly and severally liable for any joint debt. If your partner plunders the joint account and it goes overdrawn, you will be liable for it all. Prepared to be full and frank? As part of your divorce process, you will both be expected to give full and frank disclosure about your finances. You should not be able to keep assets, investments or funds hidden. Typically the financial disclosure process looks back only over the last 12 months when your bank statements for that period will be disclosed. Is there anything there you might not want disclosed? Watch out though as in some cases, a longer period of financial disclosure may be ordered by the court. Don’t assume that you can go on a forensic fishing exercise. There are strict rules about how to deal with financial papers you’ve got hold of that don’t belong to you. Take advice and deal with the disclosure process properly. 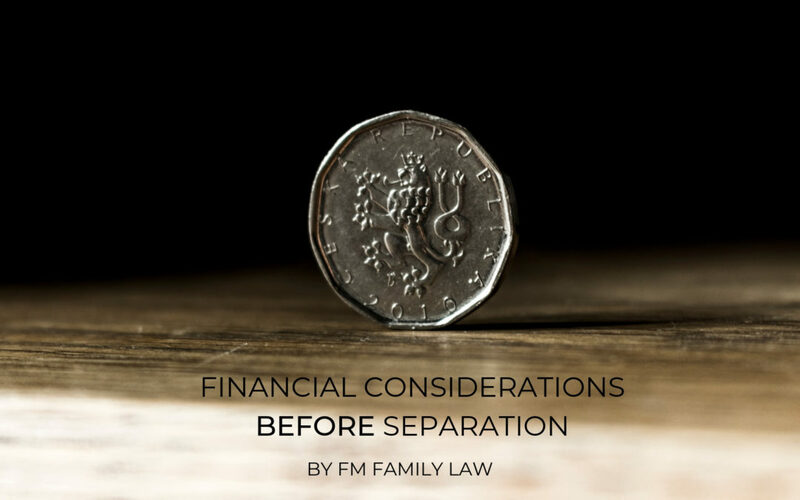 FM Family Law are experts in giving pragmatic and sensible legal advice about the law, but also how best to prepare for separation: legal and financial.